Published: June 15, 2016 at 12:29 p.m. Updated: June 15, 2016 at 12:54 p.m.
College Football 24/7's "16 for '16" series continues with a look at 16 coaches who are most effective at developing NFL talent. Recruiting certainly plays a big role in which programs bring in the top high school talent in the country, but getting that talent adjusted to the college game and, eventually, ready for the NFL is an entirely different task. While some coaches listed here produce a very high number of draft picks, it's not just a compilation of football factories -- room was made for coaches who develop players effectively regardless of the volume of NFL talent they produce. 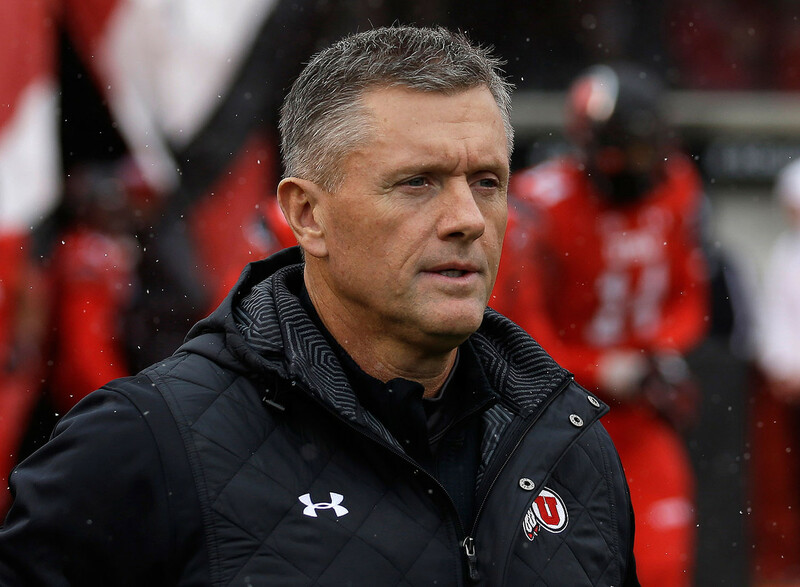 Recruiting elite high school players to Utah isn't easy. From a geographical standpoint, it's not a hotbed for in-state talent nor is it as flashy an option as USC or Oregon, and 247Sports hasn't ranked any of its last five signing classes in the nation's top 35. Still, Whittingham has managed to generate his share of NFL draft picks -- 10 in the last five years -- including three of the first 66 picks in 2015 (Eric Rowe, Nate Orchard and Jeremiah Poutasi). His peak year for draftees came in 2010, when Whittingham had six players selected. A good example of Whittingham's developmental skill is former DE Nate Orchard. In 2011, Orchard signed with the Utes as a three-star wide receiver. Utah immediately switched him to defensive end, where he flourished into an All-American and ultimately a second-round pick of the Cleveland Browns. A whopping 15 NFL draft picks in 2015 were coached by Strong at one school or another. If you don't want to give Strong too much developmental credit for the one season he spent with Texas' five picks that year, consider that he coached Louisville's school-record 10 draft picks in 2015 for a longer stretch. A year earlier, Louisville had three first-rounders coached by Strong: Calvin Pryor, Marcus Smith and Teddy Bridgewater. In a state in which he has to regularly recruit against the likes of Texas and Texas A&M, Patterson doesn't get as many "three-and-out" players as some other top programs. Nevertheless, Patterson's program has produced at least five draft picks three different times (2001, 2009 and 2016). In the two years prior to Patterson taking the head-coaching job, TCU didn't have a single player drafted. Following his first season, it had six, including LaDainian Tomlinson. One of Patterson's best developmental stories is QB Andy Dalton, an undersized (6-foot-2, 180 pounds) and lightly recruited three-star prospect out of high school, who went on to star for the Horned Frogs and start for the Cincinnati Bengals as a second-round pick. Charlie Strong gets most of the credit for developing the Cardinals' 10 draft picks of 2015, so Petrino can only take a smaller share of it, having coached that group for only one season. Still, his track record in his previous stint at Louisville and then at Arkansas includes an impressive 23 selections. And following his one year at Western Kentucky, the Hilltoppers had two late-round draft picks and an undrafted free agent who made the cut with the Tennessee Titans: RB Antonio Andrews. Hired in December 2011, Mora witnessed the Bruins get shut out of the 2012 draft before he'd even coached a game. Four years later, he's placed 20 players in the draft, including three first-round picks since 2013 (Datone Jones, Anthony Barr and Kenny Clark). This year's UCLA draft class went eight deep with selections. The best single draft argument for Petersen's program came not at Washington, but at Boise State in 2012. The Broncos produced six picks that year, including first-round selections DE Shea McClellin and RB Doug Martin. That's a strong draft year for a big-time Power Five program, and a spectacular one for a Mountain West Conference school such as Boise State. Martin was a lightly recruited two-star recruit when he arrived at Boise State in 2007. He redshirted and spent five years in the program, making a progressively bigger impact before becoming a first-round pick of the Tampa Bay Buccaneers. Petersen had three 2015 first-round picks from UW, but coached those first-rounders for only one year. As a head coach, Shaw has had a developmental hand in five Stanford draft classes, each of which resulted in at least three selections. More impressively, Stanford's deeper draft classes under Shaw have been the more recent ones that spent more time in his program (17 picks over the last three years). It also doesn't hurt that Shaw has 10 years of NFL experience and -- in the spread-offense era of college football -- he runs a pro-style scheme that translates to the NFL better than most. One NFL executive who believes Stanford does the best job of developing NFL talent put it this way: "I love the culture they have at Stanford. You know their players will be coached up and are very tough." Kelly deserves credit for some big recent Fighting Irish draft classes, including eight choices in the 2014 draft and seven this year. Since taking over the program, he's turned out six first-round picks and six second-rounders, highlighted by Dallas Cowboys OG Nick Martin and Cincinnati Bengals TE Tyler Eifert. The players in his deepest Notre Dame draft class (eight picks in 2014) were coached by Kelly for their entire college careers. Over the last five years, Kelly's Fighting Irish teams have produced 26 picks. LSU has been hit especially hard in recent years by early entry losses to the NFL draft, so it follows that the Tigers have produced more than their share of draft choices. They've also populated the first round like few others; Miles has developed 13 first-round picks in his tenure, most recently Odell Beckham, Jr. In back-to-back drafts in 2013-2014, LSU generated 18 selections (nine each draft). Developing quarterbacks, however, hasn't been LSU's strong suit under Miles. His best college quarterback was JaMarcus Russell, who earned the "bust" label as a No. 1 overall pick. And for all of Miles' strong recruiting classes, quarterback play at LSU has largely been inconsistent. The nine draft picks Clemson delivered this year marked a high for Swinney's tenure as head coach. The Tigers have had at least one first-round pick every year since 2013, including Houston Texans star WR DeAndre Hopkins. Swinney's draft-pick total since 2012: 27 players. The former Georgia coach is bringing quite a track record for NFL draft picks to Coral Gables. Criticized at UGA for not being more competitive for SEC championships, there can be no doubt about how he developed players for the pros. The first Georgia draft class to be coached exclusively by Richt was marked by two first-rounders, LB Thomas Davis and DL David Pollock, and a pair of second-rounders in WR Reggie Brown and LB Odell Thurman. The peak year came in 2013 with eight selections. Over the last five years, Richt had 27 players selected from his former school. Oklahoma's record for first-round picks in a single draft (four), came under Stoops in 2010, and three of those were gone in the first five picks (Sam Bradford, Gerald McCoy and Trent Williams). Over the last five years, 28 of Stoops' players have been selected. OU's 2005 draft class -- which was coached throughout its entire college career by Stoops -- totaled 11 draft choices. The Spartans' coach hasn't piled up the same number of draft picks as some others listed here, but few would argue that he doesn't get the most out of his players. His recruiting classes have ranked no higher than 18th in the nation over the last five years, yet he's produced 19 draft picks over the same period of time. DB Darqueze Dennard, DB Trae Waynes and OL Jack Conklin give Dantonio an active streak of first-round picks in three consecutive years. Fisher is coming off the weakest of all his FSU draft classes in terms of total picks, with the Seminoles placing just two players in the 2016 draft. But the coach's track record indicates that's very much an outlier. Fisher's program has averaged a whopping seven draft picks per year over the last five years. Over that five-year stretch, seven were selected in the first round. "They've done a great job of preparing guys mentally and physically," one NFL executive said of FSU's development of talent. "Guys like Karlos Williams aren't full-time players for them, but they step in Year 1 ready to play at our level." Ohio State has put plenty of players in the NFL draft since Meyer took over the program, but nothing like this year, when the Buckeyes led the nation with a dozen players getting the call. That class set an NFL record with 12 selections in the first four rounds. Five of those selections went in Round 1. Meyer has coached four OSU draft classes totaling 26 players. Go back to Meyer's Florida days, and you'll find the likes of Joe Haden, Percy Harvin, and Pouncey twins Mike and Maurkice. Saban's combination of recruiting skills, NFL experience and a pro-style offense make him predictably hard to beat on draft day. He's placed at least one first-round pick in the draft for eight consecutive years, and produced multiple first-rounders over five straight drafts from 2010-2014. He's had 39 draft picks over the last five years, the most of any coach listed here. As for an example of his ability to develop talent, he helped Rashad Johnson go from former walk-on to third-round pick (2009), and Johnson is entering his eighth NFL season as a DB. "Coach Saban came in and changed my mindset tremendously," Johnson said in April. "... He just began to teach me the little things about playing the position, to be able to recognize plays before they happen -- which has become kind of like my forte."